Accentuate the style of your bedroom with this beautiful striped Duvet Cover Set! Crafted from 100-percent Egyptian Cotton with a 650 thread count with a sateen weave, ensuring long-lasting softness and durability. It's tone on tone striped pattern provides a subtle yet classic look to any bedding ensemble. The duvet features a hidden clear button closure. Machine washable for easy care and maintenance. Pick and choose from any of the gorgeous fourteen (14) color shades to add a pop of simple elegance to any bedroom. Just put my new duvet cover on my new comforter-very easy to do. I ordered the gold and the color is beautiful. The material is soft. The only problem I have is the size. Both my comforter and duvet are King size, but the comforter is 86x102, and the duvet is 106x92. Go figure...So my comforter is 10 inches longer the the duvet, which leaves it a little bunched inside and leaves the duvet cover empty 10 inches on each side. I wonder if it's possible to actually have both the same size. Other than that, I plan to keep both and enjoy them all year long!!! I was totally unaware that the duvet cover could NOT be returned! I called Customer Service and explained the situation (basically wrong color) and that when I purchased it there was no statement anywhere that the item was not returnable. After being admonished to carefully read the return policy statement (where?) the statement was e-mailed to me with a return label. Unfortunately I am not too eager to purchase anything else from Overstock.com in the near future. I purchased this duvet set in ivory, the color was stunning, the quality of the fabric is superb. My bed looks now like a 5 star hotel (only better!). I will truly recommend! I'm super hesitant to buy bedding without touching...glad I bit the bullet. I'm also a super picky person when it comes to my sleeping gear. It has to be of the utmost quality. I'm planning on buying another one next month to alternate. Overstock BEYOND delivered on all counts with this set. YOU WON'T BE DISAPPOINTED!! This duvet cover is excellent!!! I purchased the queen, egyptian cotton 650tc striped duvet cover in burgundy from the US after much deliberations as I couldn't find anything I liked here in the UK. I was a little wary but it is absolutely fantastic. It is very good quality, very well made and lovely and thick. I washed it before use and it is now soft enough and keeps its shape well. I like the stripes as it gives a subtle pattern rather than the plain. It does crease quite easily though, but is good to iron. The colour is as good as the pictures, lovely deep burgundy red. The delivery to the UK was easy and hassle free and I kept track of it with the link I was provided with. Overall I am incredibly happy and would consider purchasing from Overstock again. I ordered the Gold Egyptian Cotton 650 Thread Count Striped Duvet Cover Set and am very pleased. The golden hue adds a rich look and nice accent to my light golden walls and carpeting. The duvet cover had a subtle sheen so it's not over the top. The weight of the 650 cotton duvet cover and Euro shams is very heavy so I anticipate having these on my bed for many years to come. I ordered the queen size down-filled comforter to put in the duvet cover and I feel that the queen size duvet cover could handle a king size down comforter. I think it was a fabulous price for the quality! I've had this set for five years and was only reminded to write a review because I needed another set to replace my bedding after I got blue pen marks on my duvet. Otherwise, it has held up over the years and over time the duvet cover has become softer too which is a nice plus. It has not pilled on me ever, nor does it look like it will anytime soon. At 650 thread count, this means the duvet cover will be more structured, crisp, and dense; however I like my duvet covers a bit denser, while I like my sheets a bit silkier, so these were perfect. For duvet covers, I highly recommend this set. I gave it four stars simply because I was going for a purple, ivory, and gold color scheme and it didn't really work out because the gold sheets are more of a yellow. However, I still kept it because of the quality. There are also some loose threads on the duvet covers, but I think that happens with any sheets - just cut them off! I must say I am very confused about the negative comments regarding this amazing duvet set. It must be washed before use due to the funky smell and also because the thought of using any bedding product without washing it just turns my stomach. If you wash it in cold water and then dry on a low setting it will not shrink. As far as it being wrinkled, of course it will be! I don't care what you wash, if you don't pull it out immediately and either spread it or hang it, it's going to wrinkle. Once I got it on my comforter and pillows then smoothed it with my hands, the wrinkles disappeared. I also love it because I have two spoiled dogs, one white and one black, who believe their world will come to an end if they don't sleep with me. This is the first duvet set I've owned where all I have to do is snap it out when making the bed in the mornings and the pet hair falls right off. It is soft, the perfect weight, and looks beautiful. As long as you don't have the idea that if you wash it in hot water it won't shrink or that you can leave it in the dryer for two hours and it won't wrinkle, then you will be very happy. After reading so many positive reviews, I was excited to receive these sheets in the light blue. Upon opening the package, I noticed immediately some loose threading, some of which was totally loose, and other of which was still threaded in the duvet cover but coming undone. With a bit of trepidation, I washed the duvet cover, and now there is an approx 5 inch hole along the top where the threading has come completely undone. I guess you get what you pay for. The cover itself looks pretty nice, but it is definitely shoddy craftsmanship. This is my first time ordering bedding from Overstock.com (I've bought a number of other items, normally paintings and furniture accent pieces) - I'm not sure if it's normal for the tags on the sheets to not name the manufacturer? Seems suspicious. I will not be sending it back but rather heading over to the local seamstress to see if they can fix it. The threading on the pillow shams is still mostly in tact but visually looks to be of poor worksmanship (this is actually the first thing I noticed...I'm not planning to use them so didn't mind so much, but be warned, if you plan to display them, they look fairly poor). Maybe I just got a lemon...but be warned that if you see loose threading when you open the package, just send it back! I first has to find out what a duvet cover was and why I needed it to cover my down comforter. but after review I decided to get the egyptian 600 count thread duvet cover, It is a very soft, luxurious fabric, washable, button closeing for easy fit and it wil keep my white down comforter clean. Cost , color. style, and service were excellent. I'd definitely wash these 1-2 times before use. Once washed, they softened up and look fabulous. I got them in ivory and they look crisp and gorgeous in my room. Nice and thick, but not too thick, with proper king shams. Definitely looks like hotel bedding. Still great quality several years later! Still great quality several years later! Very soft. Does not lose color with washing. I am really happy that I purchased this duvet. It is very soft and has a really nice sheen. I purchased the lavendar color and it looks great on my bed. It washes well and does not pill. I like the 600TC because it is not too heavy but still has a nice tight weave. The Egyptian cotton is my favority because it is breathable, soft and luxurious. I buy all my bedding from Overstock because of the great quality and value. Thank you Overstock! The high threadcount makes all the difference! Washable, affordble and sytlish. I'm going to order 2 more in different colors. Very lovely. Soft and nice mint color. Good product. Always stands up to washing and works well with my down comforter. The color ordered was gray but in some lighting it looks like a muted purple. Still like the product since I know the issue is with my lighting and not the duvet. Many duvets aren't sold with pillow covers these are - great addition. I love the Duvet cover! The only disappointed is the color. It was suppose to be a silver/grey color. As you can see, the second picture has a grey jacket laying on top of it and clearly the color does not look grey. It is difficult to tell with the pictur but the color looks like a mauve/purple color. Other than the color, I love the quality. High quality, nice weight and very easy to wash. Very pleased with purchase. Washes up very well...and I wash my duvet cover frequently. Easy to insert comforter without wrestling. Stays on and in place during use. Perfect weight. High quality set. i bought 2 sets of this product- in cream and in white. Every time after wash and iron these pillow cases and douvet cover, - all turns into yet again fresh, new, crispy set like just has been purchased! excellent. Love this duvet cover set! Great quality and softness. Perfect for a master or guest bedroom. 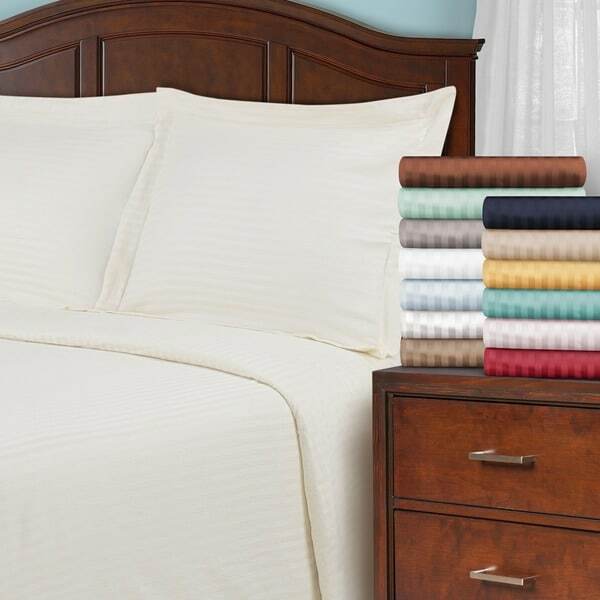 You won’t find this high of thread count for this price anywhere else! We have been used it for 3 years, and it is still our favorite duvet cover. Highly recommend! "I'd like to see which the beige, tan and taupe are, but I don't seem to see a way to isolate the names by color. Am I missing something?" "I would like to know origin of this item." This duvet cover set says it is made in China. "need a luxury california king with zipper"
"Are there interior ties to hold the comforter in place?" "The Burgundy looks very red on my screen. I think of burgundy being a little more purple. Can someone please describe the burgundy for me? Thanks." Hello gjhghjuih, we can appreciate the fact you want a firsthand account of the product. You will receive an email notification every time you get a response. Thank you for shopping with us. It is more of a reddish burgundy rather than a wine burgundy. "When I ask specifically for FULL sized Duvet covers, why am I automatically always shown full/queen sized Duvet covers? This doesn't make sense either for you or for me? I am only looking for Full sized covers. Full/Queen sized covers are very hard to put on and never look right. I need you to correct this, please." Hello timincm, full and queen-sized duvet covers share the same measurements as a standard. We apologize for the confusion. Thanks for shopping with us! "Do you not offer white anymore?" Hello Tracy V., items are restocked as they become available; however, we cannot guarantee an item will be restocked. Thank you for shopping with us.